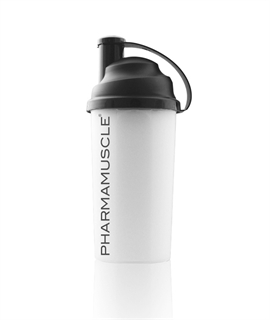 700 ml Pharmamuscle Shaker. The perfect option for mixing all of our powdered sports nutrition supplements including WHEYMAX, CREAPLUS, MEGA CEE and Opti-Glutamine Powder. With screw on lid and an integrated spout in the shaker lid. The perfect option for mixing all of our powdered sports nutrition supplements including WHEYMAX, CREAPLUS, MEGA CEE, Opti-Glutamine Powder and L-Arginine. Large 700 ml/ccm or 25 oz content plus enough space to shake. With an integrated scale directly in the shaker bottle for accurate measures. A screen avoids lumps and with the integrated spout in the lid you can enjoy the drink right out of the shaker. The Original Buchsteiner MixMaster Shaker® is 100% leak-proof, no matter if your drink is milk or water based and is easy to clean and is dishwasher safe. Made from the highest quality raw material, you can be sure that the Bunchsteiner MixMaster Shaker will last. The manufacturing process of the Original Buchsteiner MixMaster Shaker complies with every safety regulation regarding food contact. Certified by independent laboratories.